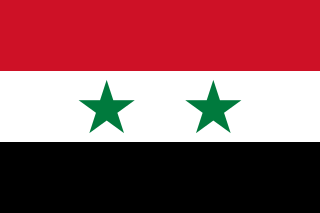 The country of Syria is administratively subdivided into 14 governorates, which are sub-divided into 65 districts, which are further divided into 284 sub-districts. Each of the governorates and districts has its own centre or capital city, except for Rif Dimashq Governorate and Markaz Rif Dimashq district. All the sub-districts have their own centres as well. Each district bears the same name as its administrative centre, with the exception of Mount Simeon District where the centre is the city of Aleppo. The same applies to all nahiyas (sub-districts), except for the Mount Simeon Nahiya where the centre is the city of Aleppo. Sixty-four of the 65 districts of Syria have a city that serves as the regional capital (administrative centre); Markaz Rif Dimashq is a district with no official regional centre. 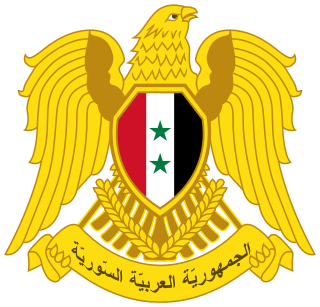 The city of Damascus functions as a governorate, a district and a subdistrict. The Rif Dimashq Governorate has no official centre and its headquarters are in Damascus. The first 13 cities in the list are the centre of their governorate, as well as of their district. The population figures are from the 2004 official census. ^ a b "Administrative divisions" (in Arabic). Central Bureau of Statistics of Syria. Archived from the original on 2007-03-29. Retrieved 2007-04-05. Rif Dimashq Governorate is one of the fourteen governorates (provinces) of Syria. It is situated in the southwestern part of the country. It borders the governorates of Quneitra, Daraa and al-Suwayda in the southwest, Homs in the north, Lebanon in the west and Jordan in the south. Dara`a Governorate is one of the fourteen governorates (provinces) of Syria. It is situated in the south-west of the country and covers an area of 3,730 km². It is bordered by Jordan to the south, Quneitra Governorate to the west, Rif Dimashq Governorate to the north and Al-Suwayda Governorate to the east. The governorate has a population of 998,000. The capital is the city of Daraa. The 14 governorates of Syria, or muhafazat, are divided into 65 districts, or manatiq, including the city of Damascus. The districts are further divided into 281 subdistricts, or nawahi. Each district bears the same name as its district capital. Markaz Rif Dimashq District or Damascus Central Countryside District is a district of the Rif Dimashq Governorate in southern Syria. 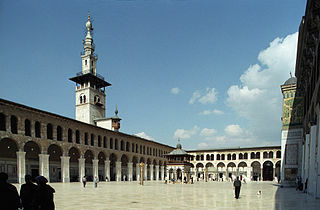 Religion in Syria refers to the range of religions practiced by the citizens of Syria. Historically, the region has been a mosaic of diverse faiths with a range of different sects within each of these religious communities. The majority of Syrians are Muslims, of which the Sunnis are the most numerous, followed by the Shia groups, and Druzes. In addition, there are several Christian minorities. There is also a small Jewish community. Qudsaya District is a district of the Rif Dimashq Governorate in southern Syria. Zamalka is a suburb of Damascus in Syria, located 3.5 kilometers (2.2 mi) east-northeast of Old Damascus. It is administratively a part of the Markaz Rif Dimashq District of the Rif Dimashq Governorate. Nearby localities include Jobar and Qaboun to west and northwest, Harasta and Arbin to north and northeast, Hamouriyah and Saqba to east, Kafr Batna to southeast, Ein Tarma to the south and Al-Maamouniye to southwest. The Aleppo-Damascus Highway is the districts boundary in the west, separating Zamalka from the Jobar municipality of Damascus. Al-Qastal is a village in southern Syria, administratively part of the Rif Dimashq Governorate, located on the northeast of Damascus, on the ancient caravan route to Homs and Aleppo, in the Qalamoun Mountains. Nearby localities include Yabroud, an-Nabek, al-Sahel and Deir Atiyah to the north, ar-Ruhaybah, Jayroud, al-Dumayr and al-Qutayfah to the south, and Ma'loula, Assal al-Ward and Hosh Arab to the southwest. According to the Syria Central Bureau of Statistics, al-Qastal had a population of 3,486 in the 2004 census. Its inhabitants are predominantly Sunni Muslims. Qaldoun al-Marah is a village in southern Syria, administratively part of the Rif Dimashq Governorate, located on the northeast of Damascus, on the ancient caravan route to Homs and Aleppo, in the Qalamoun Mountains. Nearby localities include Yabroud, an-Nabek, al-Sahel and Deir Atiyah to the north, ar-Ruhaybah, Jayroud, al-Dumayr and al-Qutayfah to the south, and Ma'loula, Assal al-Ward and Hosh Arab to the southwest. According to the Syria Central Bureau of Statistics, Qaldoun al-Marah had a population of 2,561 in the 2004 census. Jubb al-Safa is a village in southern Syria, administratively part of the Markaz Rif Dimashq District of the Rif Dimashq Governorate, located just east of Damascus. Nearby localities include al-Buwaydah to the southeast, al-Masmiyah to the south, Ghabaghib to the southwest, Kanakir to the west, Khan Dannun to the northwest, Deir Ali to the north and Khirbet al-Ward to the northeast. According to the Syria Central Bureau of Statistics (CBS), Beit Sawa had a population of 2,499 in the 2004 census. Sa'sa' is a town in southern Syria, administratively part of the Rif Dimashq Governorate, located southwest of Damascus near the Golan Heights. Nearby localities include Kafr Hawr to the north, Kanaker to the east, Khan Arnabah to the southwest, and Deir Maker to the south. According to the Syria Central Bureau of Statistics, Sa'sa' had a population of 9,945 in the 2004 census. The town is also the administrative centre of—though not the largest town in—the Sa'sa' nahiyah, which is made up of 17 towns having a combined population of 45,233. Zabdin is a village in southern Syria, administratively part of the Markaz Rif Dimashq District of the Rif Dimashq Governorate, located just east of Damascus. Nearby localities include al-Malihah to the west, Shabaa to the south, Deir al-Asafir to the southeast, Harasta al-Qantarah and Marj al-Sultan to the east, Beit Nayim to the northeast and Jisrin and Saqba to the northwest. According to the Syria Central Bureau of Statistics (CBS), Zabdin had a population of 7,003 in the 2004 census. The Supreme Military Council (SMC) was the highest military leadership of the Free Syrian Army (FSA) from late 2012 to at least mid-2014. The establishment of the organisation was announced on 7 December 2012 with the backing of western and Arab powers as a means of financing and arming Syrian rebel forces. The Forces of the Fighters of the Tribes, sometimes called the Tribal Army, is a multi-tribal militia affiliated with the Syrian Military Intelligence Directorate that take part in the Syrian Civil War. Led by Turki Albu Hamad, the Fighters of the Tribes played a vital role in the Assad government's efforts to retake central and eastern Syria. The militia is affiliated with the pro-Ba'athist branch of the Arab Socialist Movement, and is closely allied with Russia.